Historically, the Double-crested cormorant (DCCO) has been one of the most misunderstood and maligned of all native Minnesota bird species. Since the mid-1800s, they have been accused of being a voracious fish-eating bird and have been clubbed, shot, and had their colonies destroyed. As people raise concerns about cormorants, it is important to sort between fact and fiction so that efforts to manage Minnesota’s wildlife and fisheries resources are based on sound science and not on emotion. This includes cormorant management. For that reason, these questions and answers have been compiled to address some of the most common inquiries about this bird. What is a double-crested cormorant? The DCCO (Phalacrocorax auritus) is a goose-sized waterbird in the family Phalacrocoracidae. The DCCO is the only cormorant species found regularly in Minnesota. What does a cormorant look like? The cormorant is characterized by a long, thick neck, stout body, short rounded wings, medium length tail with stiff feathers, and legs that are positioned far back on the body. Webs connect all four toes on each foot and provide additional thrust in swimming. The DCCO appears black or grayish-black, but it has iridescent greenish and purple highlights on the back. It has a small fleshy yellowish-orange throat pouch, and the eyes have a deep turquoise-colored iris. The long slender bill has a small hook at the tip. This species gets its name from the presence of tufted feathers on both sides of the head, just above the eyes, that are referred to as “crests.” These are present only during the nesting season. In flight, the cormorant can be identified at great distances by its behavior of alternately flapping and gliding while flying in v-shaped flocks. In contrast, ducks and geese have a steady wingbeat. While perched or swimming, the bill is usually held at an upturned angle. In contrast, ducks, loons, and grebes usually hold their bills parallel to the surface of the water. Often cormorants dry their feathers after swimming by holding their wings out creating a distinctive posture that generates interest and curiosity about this species. How large is a cormorant? The DCCO ranges from 29 to 36 inches long from bill to tail, and the wingspread may reach 54 inches. Weights range from 4 to 6 pounds. Cormorants do not nest until they are 3 years old. Nesting begins shortly after ice-out in April and extends into July. Three to four eggs are usually laid in a nest, and they require 24 to 25 days for incubation. The young fledge 35 to 42 days after hatching. What is a colonial nester? A colonial nesting bird is a species that nests in close proximity to others of its species and sometimes in close proximity to other waterbirds. The cormorant is called a colonial nester. These colonies are usually located on the ground, in cliffs, in dirt banks, or in trees. Some colonial nesting birds nest in cliffs and on dirt banks (e.g. bank swallows) but not colonial waterbirds. Examples of colonial nesting waterbirds in the State include Great Blue Herons, American White Pelicans, DCCOs, Black-crowned Night-herons, Great Egrets, Ring-billed Gulls, Franklin’s Gulls, Common Terns, and Forster’s Terns. DCCOs may nest either in stick nests that they build on the ground on islands or peninsulas, or in live or dead trees at or near the shoreline of lakes and rivers. Black-crowned Night-herons and Great Egrets may nest in marshes either on bare ground or with nests attached to Phragmites stalks, and Black Terns and Forster’s Terns nest in openings in freshwater marshes. In Minnesota, cormorant colonies may range in size from 4 to 2,500 nests. How common and abundant was the cormorant in historic times? The cormorant was a common and abundant breeding bird throughout much of the state in the presettlement era but it was nearly extirpated by the late nineteenth century. How many cormorants nest in Minnesota? In 2010, a statewide count of cormorant nesting colonies revealed 15,425 nesting pairs, a total of 30,850 nesting birds. The statewide population, including non-breeding cormorants, is estimated at about 40,000 birds. Non-breeding cormorants may be present at colony sites until they reach breeding age at 3 to 4 years of age. Though cormorants were documented nesting at 42 sites in 2010, 76% of the state’s population occurred on just ten lakes. In addition to nesting cormorants, there are also large numbers of cormorants that migrate through Minnesota to Canadian nesting grounds in the spring and again through the state as they migrate south in the fall. Is the cormorant population increasing or decreasing? The first complete statewide census for this species occurred in 2004, and estimated a total of 16,000 pairs at 38 sites. The next complete census occurred in 2010 and documented 15,425 nesting pairs at 42 sites. Distribution and abundance appeared similar in both survey periods. The cormorant population in Minnesota experienced a rapid growth phase between 1981 and 1997, with an average growth rate of 4.6 per year. During this time period, cormorants experienced rapid growth across much of the continent as populations recovered from DDT and benefited from legislation and protection. Though complete surveys were not conducted during this period, monitoring in Minnesota estimated 8,000 pairs at 25 sites in 1988, while in 1997, there were an estimated 12,000-14,000 pairs at 66 sites. Data obtained between 2004 and 2010 suggests the rapid growth phase has ended. The state’s population appears to be stable or slightly declining, but counts at some colonies have increased. How much does the cormorant eat and what do they eat? In Minnesota, cormorants have been found to consume from 1.0 to 1.5 pounds per bird per day. The majority of their diet is made up of fish (99.9% in Leech Lake) but they also eat snails, crayfish, and amphibians. Ninety percent of the fish they consume are 5.3 inches or less in length and have an average weight of 4.2 ounces. Cormorants are opportunistic feeders and will prey on a variety of species that seasonally varies. The diet is a usually considered a reflection of the relative abundance and sizes of prey species present at the time of foraging. A study by J. Coleman in Oneida Lake, New York, however, showed that cormorants preferred walleyes that were one and two years old compared to younger walleyes. It is not known if the situation from New York would be comparable in Minnesota. The majority of the diet is comprised of young life stages of sport fish and smaller nongame species. In Minnesota this often includes yellow perch, minnow species, cisco, and walleye. How much of a cormorant’s diet is comprised of walleyes? A study of cormorant food habits on Lake Winnipegosis in Canada revealed that of 10,911 fish eaten by cormorants, only 30 were walleyes (0.20%). A study in Lake Oneida in New York showed that cormorant diets consisted of between three and five percent walleyes in a year, mostly eaten during the fall bird migration. Walleye contribution to Leech lake cormorant diets was similar to that on Lake Oneida with walleye comprising only 4.6% of the average diet. However, walleye composition ranged from 1.4% to 11.1% across the four years that diets were examined, and by weight this consisted primarily of age-1 and age-2 walleyes. The variability in Leech Lake walleye consumption was associated with the number of small walleyes available and the presence of other alternative prey sources, particularly cisco. During years cisco may be more vulnerable such as during a summer kill (as occurred in 2006), predation on other species such as walleye and yellow perch was lower and total consumption was also lower. Do cormorants negatively impact fish at a population level? Cormorant foraging can potentially have a negative impact on recreational fishing at a localized level. However, such impacts are very difficult to detect and measure because of many other factors operating within the ecosystem can affect fish populations. Such factors include fish stocking, fishing regulation changes, exotic species introductions and population expansion, normal variability in year-class strength, predation, competition, loss of habitat caused by shoreline development, and excessive commercial and/or sport fishing pressure by people. Cormorant population management on Leech Lake is often cited as a situation where control was necessary to improve the local walleye fishery in Minnesota. In this situation there was circumstantial evidence at the time control was initiated that cormorants were reducing survival of small walleyes, which in turn translated to fewer catchable-sized fish for anglers. Some walleye stocking was undertaken to address the walleye decline. Fisheries biologists examined cormorant diets and re-constructed walleye year classes produced from 2000 to 2004 to see what the walleye population structure might have looked like in the absence of cormorant predation. This analysis indicated that the predation pressure by the expanding cormorant population could have been sufficient to impact walleye survival to older age classes. The use of a lake by cormorants does not mean the fishery is at risk. For example, Lake of the Woods supports one of the most abundant cormorant colonies in North America and it also supports one of the most recognizable walleye and sauger fisheries in the country. Similarly, management activities at Leech Lake have reduced the cormorant population to a level where fish consumption by cormorants is expected to have little effect on the fishery. This is considerably different than eradication and, based on increases in fish population surveys, appears to be appropriate. What does it mean that most cormorant predation on fish is usually “compensatory” and not “additive”? Cormorants commonly eat small fish under six inches in length. Sport fish of this size are not typically caught by anglers. Fish of this small size are more often eaten by predatory fish as well as waterbirds and mammals. A four-to six-inch long fish has a relatively low chance of growing to become a legal or desirable size for an angler because if it does not die of one cause, it will die from another. This is called “compensatory mortality”. In other words, most of the fish eaten by cormorants would have probably been eaten by larger fish or other predators. This is common in all animal populations and this type of mortality does not decrease fish populations. However, if there are unusually high predation rates on a particular group of fish that reduces those year classes in an unusual manner, this is defined as additive mortality. This was documented at Oneida Lake in New York during the period from 1995 to 2000 for yellow perch and walleyes. Larger fish that are at least 12 to 14 inches long (for example, walleyes in the 3-year or greater age classes) may occasionally be taken by cormorants, but that is the exception rather than the rule. Excessive mortality from any cause in these older age classes becomes “additive” because such mortality can decrease the fish population if it occurs at excessive levels. Can cormorants cause problems for baitfish production or fish farmers? Yes, cormorants, as well as other fish-eating birds, can be a problem in small natural ponds where bait dealers release minnows for later seining. Minnows in these small ponds are vulnerable to predators because the ponds are typically untended natural waters easily discovered by fish-eating birds. Ponds are also shallow which make the minnows easy for cormorants to catch. Similar issues can exist at aquaculture facilities. Dealers are allowed to shoot cormorants at their facilities under the Aquaculture Depredation Order when this becomes an issue. From 2003 through 2012, an average of 1,713 cormorants were killed annually at baitfish ponds and aquaculture facilities in Minnesota under terms of this depredation order. 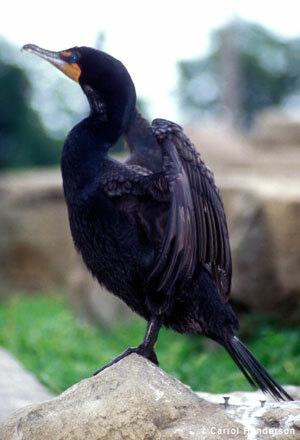 A total of 1,540 cormorants were reported killed under the Aquaculture Depredation Order in 2012. These numbers, of course, assume that the numbers reported are accurate. Do cormorants damage vegetation in rookery areas where large numbers of cormorants nest? The natural vegetation at all waterbird colonies typically dies from the long term accumulation of guano at the site. This is a natural, dynamic process in which tree-nesting birds may subsequently move to nearby groves of trees and some species like cormorants may move from tree-nesting sites to the ground. With the open ground cover created by the loss of trees and shrubs, ground-nesting waterbirds can move in, including American White Pelicans, Common Terns, and Ring-billed Gulls. Is the loss of vegetation at a cormorant colony a cause for concern? Typically, this is not an environmental concern because the plants affected are common trees, shrubs, and forbs like cottonwoods, willows, and stinging nettles. Where vegetation changes occur on public lands, agency resource professionals assess whether or not rare plants are at risk. If not, cormorant control on the basis of vegetation changes is not warranted. Some vegetation changes may actually create suitable habitat for Species in Greatest Conservation Need like the American White Pelican or endangered species like the Common Tern. In other states, DCCO control has been used in selected cases to preserve trees and shrubs for nesting by wading birds. What about the loss of vegetation on private land caused by cormorants? Where there is significant vegetation damage by cormorants to private property, provisions exist to address this. However, cormorant control is not allowed to negatively impact other colonial waterbirds that are present. In these instances, control is usually carried out by professional control agents through APHIS (US Dept. of Agriculture) for a fee paid by the landowner. Is the cormorant a threat to aircraft from collisions? DCCOs could potentially be struck by aircraft, but the likelihood is extremely low. A greater threat is posed by Canada Geese, eagles, hawks, cranes, ducks, and gulls. The FAA Wildlife Strike Database for Minnesota showed that from January of 1990 through September of 2011, 1364 cases of aircraft striking birds were recorded. Only three of these records were collisions involving cormorants. Is the cormorant a human health threat as a vector of disease like West Nile Virus? There is no scientific evidence indicating that cormorants pose a greater risk of spreading West Nile Virus than other affected bird species. A total of 225 wild bird species have been found to carry West Nile Virus and the species serving as a primary source for transmitting this disease have not been identified. Is the cormorant a threat to commercial poultry operations because it carries Newcastle Disease? While it is theoretically possible for Newcastle Disease to be transmitted to poultry, Newcastle Disease in poultry operations in the past was spread primarily by humans who transported the disease in live birds, equipment, poultry products, and poultry feed. During the outbreak of Newcastle Disease in cormorants at Marsh Lake in western Minnesota in 1992 and at outbreaks recorded in 2012, no Minnesota farms were affected because effective farm biosecurity measures are routinely in place and there was no spread to poultry operations. Does the guano deposited at a cormorant nesting colony pose a public health risk? There are no documented cases of lakes in Minnesota becoming contaminated by cormorant guano or posing any public health risk from diseases like salmonella or aspergillosis. Are cormorants a protected bird species? The DCCO is been federally protected by the Migratory Bird Treaty Act. This act prohibits killing cormorants, their eggs or young and also prohibits the disturbance of the nests or young, except as provided for through federal depredation permits, the federal aquaculture depredation order, and the public resource depredation order. The DCCO is not technically protected by Minnesota statute but federal regulations cover its protection. Any authority for taking or control of this species is under the jurisdiction of the federal government. Why is there no hunting season on cormorants? Are they good to eat? Cormorants are not considered a game species or traditional sporting species by hunters. They are not good to eat because of their fishy diet. What agencies have the authority to control numbers of cormorants if they are deemed to be causing damage? What kinds of regulatory tools can be used to address cormorant damage or conflicts with human interests? Depredation Permits. Depredation permits may be issued to alleviate damage to private property (such as vegetation or stocked fish on private property) and risks to human health and safety. Before a permit application can be considered, the permit applicant must consult with the USDA Wildlife Services (WS) office and WS will assess the situation and document on WS Form 37 the damages, non-lethal options for addressing them and, if non-lethal approaches are insufficient, recommend an appropriate level of take of birds, eggs, or active nests. The USFWS then considers the permit application and WS Form 37 before deciding whether or not to issue a depredation permit. In some cases, the USFWS may require that WS does the control work (at the landowner’s expense) to minimize the likelihood that it will affect other birds that co-occur with the cormorants. From 2008 to 2010, an average of 920 cormorants were taken annually under depredation permits in Minnesota. Aquaculture Depredation Order. An Aquaculture Depredation Order was established by the USFWS in 1998 and updated in 2003. This order authorizes aquaculture producers and State and Federal hatchery operators or their employees/agents in 13 states (including Minnesota) to shoot cormorants that are “committing or about to commit depredations to aquaculture stocks”. From 2003 to 2012, an average of 1,713 cormorants were taken annually under this Aquaculture Depredation Order in Minnesota. Public Resource Depredation Order. A public resource depredation order was established by the USFWS in 2003. This order authorizes WS, State Fish and Wildlife Agencies, and Federally-recognized Tribes (acting on tribal lands only) in 24 states (including Minnesota) to reduce the occurrence, and/or minimize the risk of, adverse impacts of cormorants to public resources, which are defined as fish, wildlife, plants, and their habitats that are managed and conserved by public or tribal agencies for public benefits. There must be evidence to warrant cormorant control, there are notification and reporting requirements, and agencies acting under this order may not take actions that would impact other bird species or threatened or endangered species. In the case of fish impacts, the USFWS depends on the expertise of the Minnesota DNR that has management authority for fish as they can best assess whether fish populations are declining and the degree to which this could be due to cormorants or other factors. From 2008 to 2010, an average of 2,640 cormorants were taken annually under the Public Resource Depredation Order in Minnesota, mostly at Leech Lake. Harassment. Federal law does not prohibit the harassment of cormorants unless it causes the death of adults or the death of eggs or young at their nests. Additionally, harassment may not cause the death of adults, eggs, or young of any other bird species that might nest or roost near cormorants. Minnesota state law prohibits chasing or killing cormorants and other wild animals by persons using motor vehicles, including boats and personal watercraft. (Minnesota Statutes 97B.091 and 97A.015 Subd. 32). All bird species that nest or roost near cormorants are protected by the Migratory Bird Treaty Act? No actions may be taken towards cormorants (killing or harassment) that would cause the death of adults, eggs or young of other bird species. Incidental take of non-target bird species is not allowed under the Act. Could high populations of cormorants damage the attraction of an area as a tourism destination? There is no evidence that the presence of cormorants can reduce the attraction of an area as an important fishing and tourism destination. Anglers in Lake of the Woods frequently enjoy exceptional walleye fishing within sight of islands where hundreds of cormorants are nesting. Are cormorants interesting birds to watch? Cormorants at colonies are very interesting birds to observe. They have intricate courtship behaviors and mates often pay close attention to one another. They are excellent parents, frequently bringing fish and sometimes water to their young. The sounds of a cormorant colony are also diverse. Many people enjoy viewing and photographing this species. The Minnesota DNR Nongame Wildlife Program responded to the requests of the Hutchinson Bird Club in 2006 because the DOT Pigeon Lake Overlook on TH 15 north of Hutchinson had become obscured by trees. Travelers could no longer stop to view the colony of American white pelicans, DCCOs, great blue herons, and great egrets nesting on the island. This is the best and most accessible spot for viewing nesting pelicans and cormorants in Minnesota. The DNR had Conservation Corps Minnesota workers spend two days clearing brush and trees at the site so people could see and enjoy this wildlife spectacle. Double-crested Cormorant Conflict Management and Research On Leech Lake (2010) Steve Mortensen, Program Manager/Biologist, Fish, Wildlife, and Plant Resources Program, Division of Resources Management, Leech Lake Band of Ojibwe. Wires, L.R., K.V. Haws, and F.J. Cuthbert. 2005. The Double-crested Cormorant and American White Pelican in Minnesota: a statewide status assessment. Final report submitted to the Nongame Wildlife Program. 28 pp. State Wildlife Grants Program final report. Wires, L.R., F.J. Cuthbert and D. Hamilton. 2011. The American White Pelican and Double-crested Cormorant in Minnesota in 2010: Distribution, abundance and population change. Final report submitted to the Nongame Wildlife program. 28 pp. State Wildlife Grants Program final report. the upper Midwest, and in the U.S.